We are traveling around Brazil to talk to students who returned from SwB scholarships. Our first group was in Sao Paulo at USP. The group was positive overall. The first young woman to speak was eager to let us know how satisfied she was. People were so nice to her, she said, from the time she applied, through the special visa day until she got back to Brazil. The woman next to her also voiced her approval, but added that in her case it was particularly important that the program reached into the interior, where she was studying. One of the goals of the Science w/o Borders program is to reach into previously under-served populations. The geographical part seems to be working. Both the ease of the program and the reach became themes. U.S. universities are uniquely suited to welcome students from around the world. We have experience in our own vast country of people coming to university from far away. Our universities have dorms, which is not a common characteristic worldwide, and we have teams in place to help students adjust. A couple students spoke up about the quality of the dorms. Like hotels, they said. They were impressed by the luxury of college campuses, with their gyms, theaters and swimming pools. Perhaps these kids should talk to our kids to let them know what a great thing we have going. Some kids who had gone to the University of Nebraska actually expressed their gratitude for not having much choice of where they would go. They were unfamiliar with Nebraska and would never have chosen it, give a wide choice. But they thought the program was excellent and they loved Nebraska because of its friendly and welcoming people. One thing that struck several students was the big difference between the feeling on American campuses. In Brazil they have lots of class time and less homework. In the U.S. they have less time in class but expect to study more. They come to conclusions themselves and praised the open atmosphere. Our surveys indicate that SwB kids did well in U.S. universities and that among many their grades improved. A few kids explained from their own experience in the U.S. that classes were more challenging and more rewarding. They got better grades because they became more committed. Study was their choice and they reveled in it. It may also be that they do better because the trip to the U.S. represented a clean break with the past. They were free from many of the old strictures. The improvements in performance were most noticeable among the students who did less well in Brazil. Again, this is subject to interpretation. It could just be that they had more upside potential, but it obviously didn’t hurt that motivation improved. They didn’t know whether to characterize American punctuality and attention to deadlines as a positive or not. It was harder. One young man commented that you get your assignment and everybody is expected to have it done on time. Excuses are ignored for the most part. The same young man mentioned the downside that pot-smoking was more common on campus in the U.S. He didn’t really say that he opposed it, but he did say that he was afraid to do it since the stakes were high for him and Brazil is he was caught messing up. This led to a discussion of quality of students. Our first group of Brazilians was high quality, but there was some discussion of the future. The bigger challenge, they thought, was not academics but maturity and temperament. A SwB visit is often the first time a Brazilian young person will have been away from home. Some will be sorely tempted by the vices mentioned above, or maybe they will just cut class. Or maybe they will suffer from melancholy and homesickness. Maybe all of these things in some measure. There were few negatives in these shouts of hallelujah. Most recognized the program was started only a short time ago and rolled out quickly. Paradoxically, there were complaints of too much and too little communication. I guess the general idea was that there was some confusion. Much of this is now cleared up. Another complaint was in the nature of internships. It is hard for some people to get them. I don’t think this is a completely solvable problem. It is hard to get internships for Americans too. There is a lot of competition sometimes. There is little that we could and even less that we should do to help Brazilians out compete Americans and others. Schools are making information available and the Brazilian authorities are working with firms. This is as good as it will get. Many in the group were happy to learn that they could apply to the program again in graduate school. This is also what many American schools want. The first round of SwB was a success. We have seen a mutual enchantment. The Brazilians love the American schools and the American schools love to have them. So far, so good. I have to caution that focus groups are not a statically valid way to measure opinions. They are good for generating ideas and making impressions, but we need to be careful that we don’t fall victim to availability bias, i.e. crediting information more because it is easy to get. But in this case, the ideas from the focus group tracked with survey data, so I feel confident in my impressions. My picture up top is my front yard. I have not mowed the lawn since May of last year. Instead, I have been gathering seeds from flower beds I passed and tossing them around. This is what I have. I like it better than the manicured lawn. Vera and I met a University of Michigan delegation and accompanied them to meetings at CAPES. CAPES told the University of Michigan folks that CAPES asked IIE to respect existing MOUs, i.e. if universities have pre-existing agreements IIE will channel students toward them related to the terms of the MOU. This, he said, is another good reason to come to Brazil and make agreements. He explained how SwB is working now. Most undergraduates are assigned through IIE. Graduate students require a more granular process. Laspau is administering the graduate programs and will make the selection of programs if prospective students do not have a place in mind. However, with a conditional letter of acceptance from an American university, students can go to CAPES and receive SwB funding. CAPES may also issue conditional letters of acceptance. There is a kind of chicken & egg problem here. Sometimes students cannot finish their applications and get conditional letters of acceptance w/o conditional letters of support but they cannot get conditional letters of support w/o conditional letters of acceptance. CAPES pays stipends of $1300/month. This is enough in some cities but not everywhere. There is a $400 addition for high-cost cities. This is not a finished process and there is still a lot of fluidity. Some universities supplement stipends. CAPES is getting good cooperation with firms. There is a shortage of science and engineering talent in Brazil. Firms are eager to tap into a potential source of the best and brightest applicants. Sometimes they are very specific. Petrobras, for example, is interested only in PhDs. CAPES mentioned Boeing as a good partner. Boeing sponsored fourteen students in the first group of SwB students. CAPES didn’t need the money for scholarships this year and instead asked Boeing to sponsor internships. Boeing will sponsor thirty-one interns this year. Currently, there are more scholarships available than there are qualified applicants at the graduate level, i.e. every qualified applicant succeeds. The Michigan folks asked how they could increase their numbers. They would like to get 15-20 Brazilians a year in the graduate programs. They said that they were more interested in getting top Brazilian students than in getting money. CAPES suggested some common sense ways to get more students. An obvious target market consists of students already at the school, i.e. undergraduates in science and maybe even SwB undergrads. The challenge is finding them in a cost effective way. CAPES has lists, but for privacy reasons cannot share them. Michigan will have to use the old fashioned ways of meeting and greeting. Applicants to PhD programs at Michigan do not require an MA, but those starting right out of UG will probably require five years to finish their doctorates. CAPES will pay for only four years. Michigan did not see this as a problem. They can fund the fifth year, if needed. Michigan guarantees support for all graduate students, conditioned on their continued good grades etc. Michigan has admissions twice a year, although fall semester starts are much more common and graduates around 260 engineering PhDs each year. The Michigan folks explained what they see as the strength of U.S. engineering students in general and Michigan in particular. American schools are very welcoming to foreign students. Michigan has a Brazilian student association and a Brazilian-American professor on the Michigan delegation assured At Michigan, students get lots of hand-on experience. Michigan students and professors are well integrated with businesses. There is lots of cross-fertilization, with academics providing brain power and theories and firms contributing money and a practical reality-check. Making Brazilian education more like this is a goal of the SwB program. Brazilian universities tend to have a more hands-off and even a vague dislike of working too closely with business. Michigan has a research budget of $1.27 billion; the engineering departments have “only” $190 million. CAPES asked the Michigan folks to send more students and especially PhD scholars to Brazil. They want Brazil more connected to the bigger world of science and engineering. They are not very worried about Brazilian students going overseas and not coming back. This could happen sometimes, but Brazil is offering so many opportunities these days that they expect to provide good jobs for all Brazilian technology grads and then still have a labor shortage. In the interests of internationalization, CAPES, which evaluates and certifies all university programs in Brazil, is considering adding an international exchange component to its evaluation criteria. A structure change like this is a big deal. It will alter the incentive structure and so the reality of how the system works. We had an interesting discussion with a Brazilian student recently returned from a Science w/o Borders scholarship at the University of Nebraska. When we set these kids off to places like Nebraska, I wondered how they would adapt to the cold. There is no place in Brazil that ever gets as cold as Nebraska does on a typical night in February or March. In fact, summer in Nebraska is cooler than winter in most of Brazil. But they evidently liked the cold or at least didn’t mind. He talked about the differences in our countries. Little things count. Brazilians hug on the first meeting, Americans not so much. Brazilians and Americans like bean. But the Brazilian black beans and rice is very different from our pork & beans that Brazilians call sweet. On the plus side, people are similar in both countries in their general goodness. Our Brazilian friend cautioned his fellows not to mistake Americans’ more distant body language as a sign of distance of coolness. He said that the people of Nebraska were almost uniformly friendly and welcoming. I felt proud of my fellow Americans. One big surprise for our Brazilian friend was how sparsely populated were the “big” cities of Nebraska. Nebraska is not the most densely populated of American states, but American cities are fundamentally different from Brazilians ones. Brazilian cities are much denser. You are driving through mostly empty territory until suddenly you see a city. It is almost like looking at a wall of tall buildings rising out of the soil. American cities have extensive suburbs. You begin to drive into the city long before you get to the center. And when you get to the center, it is often not very densely settled. I have noticed this difference myself when driving and flying. When flying over the U.S. at night, you see lights spread out over wide areas. There are houses and streets down there. In Brazil there cities are areas of very bright light surrounded by darkness. Our biggest tool in SwB and education involvement in Brazil in general is the Fulbright. It was Fulbright that made possible the Brazilian use of IIE and Laspau, without which SwB just would not have worked for us. It is Fulbright that is administering the 1080 Brazilian English teachers travel to the U.S., the U.S. Community Colleges & the Humphrey Program, among many other things. We don’t think about Fulbright much of the time because it just works. But clearly, if we didn’t have a Fulbright Program, we would have to invent one to do the many things we want done. I chaired the Fulbright Board meeting Thursday, and would like to share some notes. The Fulbright Board meets four times a year. It is a binational board with Brazilian and American members. I am the ex-officio president and I have a counterpart appointed by Itamaraty. The Brazilian and American governments jointly support Fulbright activities. Given the GOB emphasis on education in the last couple years, Fulbright has become more important, but most of that growth has been as a facilitator of programs. Another crucial role Fulbright has been playing is that of connector. Our board includes influential people, among them reps from CAPES, Itamaraty and academia. These connections have proved extremely valuable in coordinating Mission contacts with Brazil. As SwB came on the scene, we decided to move Fulbright efforts for Brazilians going to the U.S. more into the social sciences and humanities. The logic was that Fulbright could not compete and should not compete with SwB and, besides, this need was being met. This has turned out to be a good decision. We are getting many good quality applications for the scholarships, more than three candidates for each one. Far from taking away from Fulbright, Science w/o Borders has helped Fulbright by raising its profile. We have more quality applicants than ever. Among the expanding less traditional programs is Foreign Language Teaching Assistants (FLTA). We will have 45 grants, funded by the Brazilian government. These FLTAs will work in U.S. universities to increase interest and competency in Portuguese among U.S. students. U.S. students also come to Brazil to help at teachers' colleges. They are spread all over the country, currently at eighteen host institutions. More and more American schools are offering Portuguese and interest is growing. I learned that the University of Georgia is the flagship of Portuguese learning, i.e. received a big grant from the National Security Education Program (NSEP) to establish an Undergraduate Flagship Program in Portuguese. It is a program of intensive language instruction, one-on-one tutorials, Skype partners in Brazil, and other innovative curriculum. Flagship students will also spend a year in Brazil where they will reach professional-level Portuguese proficiency through language and content courses, as well as an internship experience. UGA is partnering with São Paulo State University (UNESP). This program started in 2012. Pardon the digression. To me the most impressive thing about Fulbright was the scholarship it sponsors. You can find more about what Fulbright offers at this link, but let me list them. Fulbright Commission in Brazil sponsors programs for Brazilian scholars. There are two main types: all field grants, which offer 3-4 month terms in all fields of study at U.S. universities. There are twenty-five of these grants, plus several specialized “chairs”. The chairs include: Dr Ruth Cardoso Chair in social science at Columbia, Distinguished Chair of Human Rights at Notre Dame, Distinguished Chair of Agricultural Studies at University of Nebraska – Lincoln, Distinguished Chair of Environmental Sciences at University of Texas – Austin, Distinguished Chair of Brazilian Studies at the University of Massachusetts – Amherst, Distinguished Chair of Music & Musicology at Indiana University. In addition, there is a new program that will offer five nine-month research awards. For American scholars there are forty-nine grants for 2-4 months at Brazilian institutions. Forty-five are regular grants plus five specialties including: Awards in the humanities and social sciences, Fulbright-Science w/o Borders awards in the STEM fields, Distinguished Chair in American Studies at PUC-Rio, Distinguished Chair in Environmental Sciences and Engineering at UFOPA (Santarém in Pará), Distinguished Chair in Oil and Gas sciences at. Fundação de Amparo a Ciência e Tecnologia do Estado de Pernambuco, Distinguished Chair in Visual Arts at Fundação Armando Álvares Penteado in São Paulo, plus Five nine-month post doctoral grants in any field. An important change we have decided to make is to move our EducationUSA coordinator from Rio to Brasilia. We have a network of twenty-four advisors around Brazil. Until the revolution provoked by SwB, the system worked well. Now the volume is greatly increased and we need to adapt. For example, it is no longer good to let advisors wait for people to come. Rather we need boots on the ground all over the country. We also need them to help with “simple” things like helping Brazilian students fill out the common application. 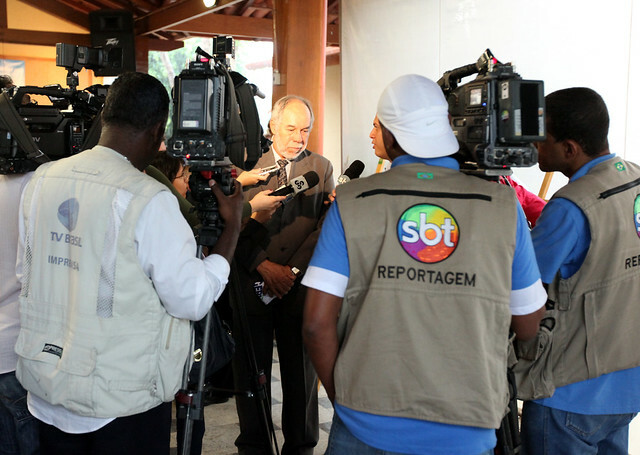 In any case, we think a more proactive stance is needed and that Brasília is that place to base our efforts, since it is the nation’s capital and is centrally located. Brasília has the best connections of any city in Brazil. You can get a direct flight from Brasília to any of the state capitals except Macapá and Boa Vista. For those you need to hop via Belém and Manaus respectively. Otherwise there was the usual business. We are moving ahead on our SwB facilitation, our English teachers and our school principal program. Lots to do and lots being done. As I learn more about how Fulbright is connected and my role, I see more possibilities. It really is a great program and I am so proud that I can be a part of it. My picture is an from when Mariza visited. It is the base of Itiquira Falls near Brasilia. The spray is exhilarating. It keeps it constantly wet and green. We are often told how bad things are. This is good if it makes us strive to be better, but not if it leads to despair. I have been working on education for the last year & I am here to remind you that we have a superb higher education system and it is adapting and getting better all the time. I am particularly impressed by the community college system, which will, after all, help train the bulk of our future labor force. I was reminded of the Morrill Act of 1862 and the follow up in 1890. You may not have heard of these things. These are among the greatest contributors to America that you have never heard of. or maybe don't know much about. The others, IMO, are the Northwest Ordinance of 1787, the Homestead Act of 1862 & the GI Bill of 1944. The Morrill Act granted land to states to build universities that would teach useful things like science, mechanics/engineering & agriculture and research the same. Their mission was the Hatch Act of 1887, which established agricultural experiment stations. Our big research universities are land grant. Most are public, the exceptions being Cornell and MIT. But I digress. I am impressed with the system. I find that it is much better than I understood it was before the visit. My earlier understanding was simplistic and outdated. I still thought in terms of a university or a school as the unit of analysis. I knew that schools created and maintained connections with other schools and the outside community, but what I didn't really understand was the extent that all these entities have effectively merged. This is why the ecosystem analogy is apt. The parts of schools are not only interacting with other parts and outside actors; they are dependent and cooperative with entities well removed from their own cooperation. It is like the bird that eats berries on top of a tree in interacting with soil bacteria that allow the roots to take advantage of minerals many steps removed. All this means that we are on the threshold of a new age of higher education. This is the same revolution experienced by big industry in the 1970s and 1980s. That was when the advantage of the big and established organizations eroded. You didn't need to have in-house services when such things were available by outside vendors cheaper and more efficiently. The education establishment hung on a bit longer providing full services. In fact, the positions of the majors strengthened as customers moved to prestige providers. There were few alternative products and it was hard to unbundle them. The value of the name was strong. I think this is changing rapidly. Educational wealth has been distributed wider. You can get a great education all over America and sometimes you don't even have to enter a prestigious university program or a university program at all. The connections are all over the place now. In my old world, you went through different stages. I remember one book I read called them "boxes of life." You didn't skip them and you rarely went back. You graduated HS; some went to college; you got out four years later and went to work for the next thirty or forty years and then retired. You were done with formal education for the most part the day you graduated. Today things are different. You have to keep learning. Students of various ages and occupations are mixing. Now you might go back to school or at least formal training many times during a working life. This education can be delivered in a variety of ways, at a variety of times by a variety of providers. The traditional four-year institution enjoys no advantages and the paradigm that brings people in at the bottom, processes them through a set program and graduates them at the end may in fact be a liability. My picture is just a big tree in New Orleans. I suppose I could think of a connection, but I just like trees. We traveled around the Louisiana and then to Washington. As I wrote a few posts ago, much of what I learned was similar to what I learned before. Educational exchanges require trust and relationships. I will not repeat that analysis again, but I do what to share some of my pictures and notes. Above are ferns on trees at the University of Louisiana in Lafayette. Many trees are covered in them. The U.S. has lots of great universities. I am fond of the more out-of-the-way state institutions. There is a lot of excellence in these smaller centers and lots of people get their educations there. We visited Louisiana Tech in Ruston LA. It is a long way from New Orleans. The Louisiana environment is a lot like southern Virginia, pines and mixed forests. It was familiar. Above is the biomedical building at LT. Below is an interesting type of store. I never saw a store devoted to irrigation. It is especially surprising in Louisiana, where it rains a lot. Below is a statue of Mike the Tiger at LSU. They have a real tiger too His home is behind the statue. I took a picture of Mike, but he was just laying there. The current Mike the Tiger is number 6. We also visited Tulane. It is a beautiful university full or tradition. It is long and narrow, only a couple blocks wide but about a mile long. Our first top was Louisiana State University Petroleum Engineering Research & Technology Transfer Laboratory (PERTT Lab) Well Facility, long name. They have working equipment and study how rigs really work under pressure, literally under pressure. They bring in various types of mud and oil to simulate real conditions. LSU is a leader in oil and gas because this is so much oil & gas in Louisiana. Much of this is conventional energy, but LSU is also gearing up to work on the unconventional new sources. Petroleum engineering is a growth industry as the new technologies have essentially created vast new sources of energy. Our friends at LSU told me that their students have 100% placement rate. This is caused by the great demand surge plus a generational change. Fewer petroleum engineers were minted after the 1980s. Many of those working today are near retirement. There is a shortage developing at the same time that the U.S. is expected to become the world’s largest oil producer within this decade and may become a net energy exporter within my lifetime. What a change! LSU folks believe in hands-on experience. With that in mind, they have their own simulation well. This is a real oil well, but it has lots of equipment that can simulate conditions that students might face in their future. They even have a hands-on test. Students are uneasy about these tests because they happen in real time, and they have to make quick decisions. LSU professors tell the students that it is better to create this kind of time pressure in the lab. You don’t want to have your first test in the real world. The equipment is used by firms as well as students and academic researchers. These firms, such as BP and Chevron, pay for the service and their work with students and professors helps everybody learn while pushing the frontiers of knowledge. There are not many intellectual property issues involved, since much of the research is testing existing technologies and often involved with health & safety and environmental protection issues. Firms want to share experience about health & safety and environmental protection, since they know that any well that causes trouble hurts all players in the industry, no matter who owns the rig. There is a lot of repetition in my notes from the Science w/o Borders visit. That is because people are saying many of the same things. It seems that the consensus is that the best way to build connections is through faculty exchanges and relationships. There seems to be consensus that one of the best ways to do this is to work on joint research projects where both sides contribute and both sides benefit. One of the ways to get this ball rolling is to hold workshops where potential participants can get to know each other and who has what expertise. Finally, there seems to be a consensus that this system of relationships takes time to construct. It is robust, but decentralized and grows organically. We (outsiders) can help fertilize this process, but we cannot really rush it. Anyway, my plan is to write notes about what I hear, try to treat each one like the first time. I understand that that many of the reports will look like many others. Instead of being a problem, I see this as a confirmation that we are onto the right ideas. Consensus is not always the way to go. We all like to imagine that the few mavericks have it right and everybody else is wong. Experience indicates, however, that this is usually not true. The work I have been doing in higher education this last year has been a real eye-opener. The good news is that the American system of higher education is simply the best. This includes our universities community colleges and training. My appreciation of the system was last updated in 1984, when I graduated with my MBA. I got to know a little more about it when the kids were applying for college, but the experience was limited; the application process doesn’t give you the kind of inside knowledge I have been getting lately. The “bad” news that there are so many great opportunities and so many permutations and they are so widespread that it is hard to understand and hard to know what to do. It is the proverbial kid in the candy shop story. The other problem is that our higher education system is a protean as it is ubiquitous. (I love to use the phrase, but opportunities are few.) It is our great strength that our system adapts very quickly. My observation is that even the people ostensibly in charge at most institutions have only an awareness of most of what is going on. This is by no means a criticism. In fact, I am impressed by their wisdom. Good leadership trusts people to innovate and imagine better things and then make them realities. I see a lot of spontaneity, serendipity and self-organizing ad-hocracies. Excuse me if I wax whimsical, but the picture is so complex and beautiful that no one can comprehend it in its entirety. Fortunately, no one has to. The parts work together autonomously and organize themselves. We did Rice University in the morning. I didn’t know much about Rice (discussed in my last post), but I did know there was such a place. I didn’t even know that the University of Houston existed. This is the complexity part. But I was greatly impressed with the people I met there. They told me that they are awarding 300 PhDs a year and they want to expand that to 400. This is no easy task. It is possible to grow too fast and, as I have learned to my sorrow, scalability is a problem when you try to rapidly increase quantity while maintaining quality, even when you are rich in resources. It takes about five years to make a PhD and you lose about 30% of them. That means that you have to take in more than 500 a year and you can expect to have more than 3000 in the system at any time. University of Houston is strong in health care and energy, as you might expect given its location is the world’s energy center and top health care complex. They also said they were good at getting innovations to market. One guy said that lots of academics know how to invent but they don’t know how to innovate. He claimed that they were separate skills. Lots of inventions just are not useful or not useful in their original form. Sometimes the inventor can take his product successfully to market. Often they need someone else to help or do it. I think the above is the big take away lesson. Few people possess the requisite combination of stills to be master the technical details, implement them, understand potential uses and how to bring them to market. Even the few people who have all these things often lack the flexibility to change their great ideas as necessary. There really are no great individuals; only great teams. When you look at great people closely enough, you always notice that the team around him plays a big role. Often when the great man fails, we see something has happened in the team around him before the problem was manifest. We spent the morning at Rice University. It is a beautiful place, a university in an arboretum. They told me that when this place was built a hundred years ago, it was marshland w/o many trees. The trees are mostly live oaks. They line the streets and fill the space between the buildings. Live oaks have that spreading aspect with branches extending almost horizontally across streets and paths. Rice is strong in engineering and sciences, especially in the ones that come naturally to an institution in Houston: oil & gas and medical services. Rice is already cooperating with Brazil and has Science w/o Borders students. They have working agreements with USP to share supercomputers and there are people to people exchanges. Our Brazilian friends expressed their interest in doing joint research with people at Rice. Rice takes Brazil very seriously. They have even established an office called “Brazil at Rice” just to take care of the Brazilians, SwB and others. Rice is working on a joint PhD program in American studies with Campinas. Students would spend two years at their home institutions and then a year at the partner. They would get degrees from both institutions. Campinas has signed onto the agreement and there are currently two Brazilian PhD students at Rice. Rice is still pushing the agreement through its bureaucracy. They are have also recently made an agreement with PUC-SP to have Rice students go to Brazil for eight week Portuguese training. The idea is that they would do this in their second year. They told us that eight weeks in country is worth a year in the classroom in Texas. They like PUC-SP because they are a reliable partner and can provide housing for the students with Brazilian families. Eight students will go from Rice this next year. Our Rice interlocutors were very interested in FLTAs. I promised to send more information. We talked about the challenges of exchanges. The biggest problem is course articulation, i.e. figuring out which courses at one university are equal to those of another. It I not just up to the universities in question. They have to answer to their accreditation boards. The challenge of cooperation is tough. It is hard enough even with close partners and two-way. It gets nearly impossible when we start talking about multilateral partnerships. I heard again at Rice what I hear all the time. Universities are decentralized with lots of autonomous sections. The best programs are done professor to professor. These things grow organically and it takes time to build relationships. People have to learn each other’s strengths and weakness and they have to learn to trust each other. This produces a flexible and robust system, but not one that can be quickly scaled up. Short term exchanges are much easier. Students just make their own deals; actually it is usually professors who make the deals for their students. What could be done to make things work better? The best thing to do is to facilitate relationships thought joint projects and workshops. Rice professor Richard Smalley won the 1996 Nobel Prize in chemistry, shared with Rice colleague Robert F. Curl, Jr. and Sir Harold W. Kroto of Great Britain for the discovery of 60 carbon structures shaped like soccer balls, nicknamed Buckyballs. They said that these Buckyballs have application in chemistry and engineers. I don’t know about such things but it must be important. I got to hold the Nobel Prize. It is bigger and heavier than I thought. After that, it was time for lunch at the truly beautiful chow hall you see in the picture. It as a useful and good visit that I believe will result in stronger ties between our Brazilian friends and American universities. The relationships are up and growing. Community colleges are one of the great innovations in education. I wrote about them in an earlier post. While in Texas I took the opportunity to visit community colleges in Houston and San Antonio. Both are working on programs in Brazil. Houston Community College, Jackson Community College (MI), and Red Rocks Community College (CO) are cooperating in the US-Brazil Connect consortium. They will send a group of students to Salvador, Bahia next month to tutor in English. Brazilians are expected to come to these schools in the U.S. this fall. Read more about it here. I know our Brazilian friends are enthusiastic about preparing their workforce to the needs of today and this will be well received. Meanwhile, our American community colleges can deepen their international profiles, a win/win. I told the Director of International Initiatives at HCC, that we would visit the students in Salvador, either I will do it myself or ask our colleagues in Rio to do it. It will be good to see what is happening and maybe we can be helpful. I also met the woman who will actually lead the group in Brazil. The next day, I drove to San Antonio to visit Alamo College. I became familiar with Alamo last year when we helped a group of student from Rio Grande do Sul get visas for an exchange with Alamo. I am always astonished by the breadth and depth of connections that Americans and Brazilians make on their own. We at the embassy and consulates try hard to make connections, but most of it happens w/o our help and much of it happens even w/o our awareness. The American nation truly is greater than the American government. But we do try to facilitate these things when we discover them and I believe we do add value. Alamo chancellor will make a trip to Brazil next month. I told him that we could help and asked that we go along on some of the visits. This is a win/win too. We help each other make connections. I also met the woman who is honchoing the connections and who has worked with Marcia in the past. You can read more about Alamo here. The Alamo people are interested in taking part in the MEC program for English teaching. They told me that they already run an intensive course on ESL for Mexican teachers and can do a similar one for Brazilians. My pictures are from Houston. I will add some from San Antonio tomorrow, but I want to get some sleep and don’t feel like editing today, yet I want to post this now. You can see from the pictures that Houston is a modern city, lots of glass and steel. There is still some green and many nice live oaks. The top picture is the HQ of Houston Community Colleges. We invested a lot of time and money in this recent trip by Brazilian leaders of higher education and I think it was well worth it. An early indication of this was the Brazilian willingness to be partners. It is always better if both sides have some skin in the game. The Brazilians paid for all air travel and per diem for their participants, a big investment. Beyond the cash outlay is the commitment demonstrated by the willingness of so many busy leaders to take three weeks out of their life – sacrificing their Carnival holidays, BTW, to take part. This not only indicates that they value the enterprise up front but also that they will be more committed to worthwhile results to make sure they justify the investment. It was clear to me that the Brazilian side took this very seriously. Our own commitment of money and attention of our own high-ranking personnel made it clear to them that we were fully onboard. The visit would have been a success if all we accomplished was confidence building, but there was much more. All three of our groups received warm welcomes everywhere they went, which with few exceptions ranged from enthusiastic to very enthusiastic. American institutions clearly think it is time to get involved in Brazil and this program is a fantastic opportunity for them. Our groups got enough firm commitments from American institutions to absorb all the students that Brazil could reasonably send their way. On the Brazilian side, this visit and deepened their growing understanding that Brazilian students should be spread across in many institutions and that excellence exists in all fifty states. The original formulation was to send students only to the so-called top-ranked institutions. Meetings during this visit confirmed that depending on the subject a University of Nebraska can be better than a Harvard. I believe that most of the Science w/o Borders students will end up going to large public research universities, like the land-grant institutions, mostly because they demonstrated the capacity and interest to accept relatively large numbers integrate them into their academic communities and help them get practical expertise thorough existing intern or co-operative arrangements that they have with local firms. Our Brazilian partners also came to a better understanding of the role that community colleges play in developing and maintaining a 21st Century workforce. Because of this visit, at least some Science w/o Borders will spend time at community colleges, principally to give them intensive instruction in English and acclimatization to the American system. Community colleges already play a role very similar to what the Brazilians need, bringing immigrants and first-time college students up to speed to benefit fully from the educational system. A potent collateral benefit was to convince there influential Brazilian education leaders of the usefulness of extending their nascent network of community college equivalents. I am certain that this will encourage links between community colleges in the U.S. with Brazilian partners in a ground floor opportunity that will enrich both sides. We cannot overestimate the importance of the contacts made and the excitement generated. The program touched key decision makers. The Brazilians who participated are in strategic positions to make changes in Brazilian higher education. The Americans they met are in similar positions in the United States. Their collaboration will bear fruit in ways we can only imagine. I believe that scores or even hundreds of future linkages among Brazilian and American institutions of higher educations will trace their provenance to this two-week crucible. The Brazilians are making a big investment in their future and tangentially in ours. We are lucky to be present at the creation of this wonderful program, which means that we have been able to help our friends shape the program’s initial form, which in turn will have follow-on effects for many years. This visit is helping us all benefit of this opportunity of a generation. Follow this link to the PowerPoint presentation on Science w/o Borders. It is always an honor to meet kids that are so hard-working and a pleasure to share in their aspirations. This is what I got to do yesterday at the Casa Thomas Jefferson branch in Taguatinga, a satellite city near Brasília, when I met this year’s English ACCESS students and presented them with their scholarship certificates. Fifty-four new students got ACCESS scholarships, which gives them two years of English study at our BNC (We cover the cost of fifty; CTJ adds in four more.) The kids are all low income and from disadvantaged backgrounds. English will give them a big boost and will help boost their communities. Being involved is also good public diplomacy for us. It helps build and maintain the web of relationships on which our good relations ultimately depend. Relationships are why I think it is so important for us – for me – to be part of these things. I was talking to my colleague Marcia about that on the way to Taguatinga. Since I just got back to Brazil the morning before, I had a lot of work to catch up, lots of paper to push. I was really “too busy” to take the time out for this ceremony. But we work through Brazilian people. My job is relationships. Paper pushing is only a means to that goal. Our program CAN go by itself. We can pay the money and forget about it. But that is like planting a garden and not taking advantage of the fruits and flowers. An American diplomat is sufficiently rare in the lives of these students that I believe that they will long remember that I shook their hands, called them by their names and gave them their certificates. It gives their program an American face – literally. Of course, I also had the chance to renew my acquaintance with school leaders from Brasília and our friend at the BNC. This is what public diplomacy is about. Marcia wrote my comments, which I have included below for reference. I still don’t trust my Portuguese to completely. Besides, at official events it is important to hit the main points but not to talk too long. W/o prepared remarks, I tend to ramble on too long. I ad-libbed a few comments at the end. I thought it was important to tell them a little about their own importance for the future of their country. Talented people have the privilege and a duty to develop their skills for the good of their country and the world in general. We need to remind ourselves and others of that. I find that most young people are receptive to that message. They want to be part of something bigger than their daily lives. I also wanted to remind everybody about the Science w/o Borders initiative and the opportunities and responsibilities that it brings. The CTJ in branch in Taguatinga teaches around 1,250 students. Among them are 250 who get their instruction at a local High School – Leonardo Da Vinci – after school. CTJ pays the school 10% of what they get in tuition. It is easier for students just to stay a little longer at school than it is to fight traffic to get to the CTJ facilities. This is a good partnership that benefits all around. CTJ people tell me that there can be significant differences among the students they attract in different locations. The Lago Sul campus gets mostly upper and middle class students. They often spend a long time at CTJ and learn to speak English almost flawlessly. Taguatinga is not much like Lago Sul. Most of the students there are poor and many come from single parent households. It is harder for them to continue their English educations, but it is a tribute to them and their parents that they continue to show up. The ACCESS program in Taguatinga has an excellent retention record, despite the challenges of its students. Of the 54 students who entered the two-year program in March of last year, 52 have returned for the second. CTJ staff is active in creating this happy result. The CTJ teachers and administrators take it personally. I heard one story about a young woman from last year’s class who was going to drop out. She was getting married and her prospective husband thought that she had better uses for her time than to study English. The CTJ director called the future husband and explained what a rare opportunity this was and that he should not take it away from her. The young man relented and the young woman returned to class to finish what she had begun. I wonder what changes this intervention will make in her life and the life of her community. In all there are 1,147 students in the ACCESS program in Brazil, in Recife, Sao Paulo, Salvador, Porto Alegre, Manaus, Rio de Janeiro, Belo Horizonte and here in Brasilia. My picture up top is the class picture. You may notice that most people seem not to be looking at the camera. This is because there were multiple cameras. The picture taking can take a long time; everybody wants a photo. The middle picture is a student from last year's class and me. She had the scary task of giving a speech in English to the new students. She did very well. The bottom picture is the street outside the BNC. - Muito obrigado, Ana Maria! - Muito obrigado à Casa Thomas Jefferson, à Secretaria de Educação do Distrito Federal e à Diretoria Regional de Ensino do Recanto das Emas pela importante parceria na implementação do Programa ACCESS. - Bom dia, alunos do programa ACCESS e PARABÉNS pela bolsa de estudos! - Vocês agora são alunos ACCESS da Casa Thomas Jefferson e participantes nesse importante programa de ensino de inglês, cultura americana e responsabilidade social. - Sintam-se orgulhosos! Vocês fazem parte de um grupo de aproximadamente 1,150 (mil, cento e cinquenta) bolsistas Access espalhados pelo Brasil em cidades como Brasília, Manaus, Recife, Salvador, São Paulo, Belo Horizonte, Rio de Janeiro e Porto Alegre. - À medida em que o Brasil cresce no cenário internacional, surgem muitas oportunidades e é muito bom ver que vocês já estão começando a se preparar aprendendo inglês. - Além de abrir portas no mundo profissional, o inglês também permitirá que vocês busquem interessantes oportunidades de estudo no exterior, com programas como o Jovens Embaixadores, o Ciência sem Fronteiras e muitos outros que existem. - Novamente, parabéns e muito sucesso para vocês! I was impressed generally with the American system of higher education. This really was a journey of discovery for me. I have more information than I can currently digest and will have to spend a lot of time just thinking about everything I learned and how to use it. I know we like to wring our hands and talk about how we are falling behind. From what I have seen and recently learned about our colleges and universities, I can say with conviction that this is not true. What is true is that others are catching up and we are actually helping. That is a good thing for us. For too long a time the task of creating knowledge and innovation has been over-concentrated in our country. We can use the help of others and all will benefit if we work in partnership. Science is a social process. It builds on the work of others and thrives best when the best minds are linked with others. Science w/o Borders will help Brazil forge links with the world of innovation and Brazil will benefit. I have grown to love and respect my Brazilian friends and I certainly wish them well, but I am American. I have to ask what is in it for America. I think there is a clear benefit for America when we have the opportunity to work with more minds and take advantage of more innovative imaginations. These connections are two-way – multiple-way – exchanges. Helping innovators in Brazil will help innovators in America and innovation is what secures our hopes in the future. What our great thinker-scientist-president Thomas Jefferson wrote in 1813, nearly 200 years ago remains true. In the 200 years since then it has been proven again and again. Jefferson wrote, “He who receives an idea from me, receives instruction himself without lessening mine; as he who lites his taper at mine, receives light without darkening me.” It gets better. In the world of ideas, when you share your light, your own gets brighter, better and longer lasting. To extend the fire-light analogy, when you are building a campfire, the flames that are separated die out, but those that are able to feed each other grow warmer and stronger. This exchange is a marvelous idea. My picture shows Constitution Hall in Philadelphia. Our Constitution was the first to address science. "Congress shall have the Power to promote the Progress of Science and useful Arts, by securing for limited Times to Authors and Inventors the exclusive Right to their respective Writings and Discoveries." The system gave inventors the right to benefit from their discoveries for a limited time on condition that they share the knowledge that went into it. This kind of idea is one of the reasons why we went progressed so fast since. Our political heritage is also a scientific one. We had excellent meetings at several universities. A few stand out. One of the last we visited and a good example is North Carolina State University. I can be a case study of what we want. If you want to find out more about Science w/o Borders in English, the NC State webpage is a good place to start. Whenever you find something working really well, you should look for a champion, somebody just pushing the program, fixing the problems and making all the good luck just seem natural. At NC State that person is Michael Bustle. Having a practical champion is rarely sufficient to make a successful program but it almost always necessary. It is an interesting leadership question. Organizations need champions but you cannot really designate one and it is sometimes difficult to recognize the person involved, but you recognize the energy in the operation. It is usually the presence of one or more of these champions that makes an operation “lucky”. There is more. NC State is a land grant institution. Land grant institutions and their like have traditions and advantages to draw on. Schools like NC State have experience with bringing in non-traditional students, educating them and adding value to citizens and society, as well as the mandate to work on practical sciences. They are, IMO, the places that will take most of the America-bound Brazilians. Another advantage is the integration with local firms and government.I wrote about this in an earlier post. One of the biggest plus in American education today is its flexibility and connections. NC State is closer than some others. Some private firms are actually located on campus, actually a new one called Centennial Campus. Centennial Campus sits on 1300 acres about a half-hour drive from the main campus. Private firms pay $35/square foot for places on campus, significantly higher than they could get farther away. They come for the proximity to students, researchers and professor. Many of the buildings were constructed by private firms for their own use. After 30 years, they will become the property of the university. I won’t try to describe all the specifics. You can read more details about Centennial Campus at this link. You will be impressed. My top picture is the North Carolina State University main campus. Below that is a fermentation lab on the Centennial Campus, where students can work in real-world facilities. Bio-manufacturing is a technology which will grow in the future, but initial investments are high and risky. A competitive advantage in the future will be the capacity to transfer innovations from university environments to real-world applications. The bottom picture shows some of the firms that are participating on the Centennial Campus. My perception of Science w/o Borders evolved during this visit. At first I saw the simple practical task of moving thousands of Brazilian kids to American universities in order to improve their educational opportunities. Of course, this is still the key task along the critical path, but it is not the big picture or the ultimate destination. The final destination is the internationalization or the re-internationalization (as I wrote in an earlier post) of Brazilian higher education. Their American experience will indeed change and enrich the lives of the individual students. But the experience such a large cohort brings back to Brazil will also change Brazilian education. In addition to its size, this is a well-targeted program. The Brazilian students will be chosen from all over the country. They are already in place to become future leaders of the country. Their already sunny prospects will be further brightened by their international experience, the things they learn and the connections they make, not least of which the connections they make among each other, the Pygmalion effect at work. They will bring greater internationalization to Brazilian education. For each one that travels in the first waves, dozens will follow along the paths created and widened. Beyond that, they will come back with new habits and different expectations. Our Brazilian friends liked the flexibility of the American system. Brazil still uses something much more like the old inherited European system. There is not a lot of flexibility and tends to be less cooperation among departments than there is today in the U.S. This is true even within universities, not to mention among institutions or with outside private firms. American universities were like this but they had to change to adapt to the new realities, as I wrote in an earlier post. We couldn’t keep the doughboys in their old habits when they came home after seeing Europe. The popular song “How ya gonna keep them down on the farm after they’ve seen Paree” reflected this. Science w/o Borders affects nowhere near as many people and is nothing like the intensity, but it does have the advantage of concentration. Smaller numbers will have high leverage in the relatively rarefied, if rapidly growing, Brazilian higher-education environment. This is also a time of maximum leverage. Brazilian higher-education is in a transition, as is the country. I understand that I am repeating many of the same themes. Maybe I should sometime combine related posts and make them more coherent, but I am writing day-to-day. My picture up top show the SwB group at the Brazilian Embassy, where we were invited to give a readout of our various visits. We had a reception at the residence that evening. The second picture shows the entrance at Meridian House. Meridian House organized the program and we did a discussion there. Our groups of Brazilian education leaders went East, West and Center to learn about Americans higher education and to explore opportunities for linkages, especially Science w/o Borders. Then we came back to together, gathering in Washington to discuss our experiences. We went all over the country, but we seem to have had remarkably similar experiences. I suppose that is because the ingredients were the same: Brazilian & American higher education folks talking about their interest in internationalizing their programs. There were some variations. One significant difference evidently was the fame of Science w/o Borders. In the Eastern campaign, we had to explain details of Science w/o Borders, but most of our interlocutors already knew a lot about the program. Our Western group reported less general knowledge of the program. I can think of several reasons why this might be true. I also have considered the possibility that it might simply be a perception difference on our part or self-fulfilling, i.e. we got what we expected. But I don’t think it much matters. One of the central goals of our trip was to inform and persuade. In this we succeeded. Whether it was explaining details to the already reasonably well-informed or bringing new information to the erstwhile benighted, they’ve got it right now. We found almost an embarrassment of riches. The American higher-education system provides more opportunities than can be exploited. A welcome challenge is the choosing among the many opportunities, but we should not believe that the beguiling number and variety of choices is not a serious challenge. Two extremes must be avoided. Our Brazilians friends are aware that they need to take care not to concentrate too much on a few places or dissipate their resources and people across to broad a spectrum. IMO the best options are in the land-grant colleges and similar institutions. They have long had the mission and the infrastructure needed to take in large numbers of students from diverse backgrounds and they have first-class research capabilities in practical sciences – the kinds of things you need to build a country. We were also mightily impressed by the community colleges we visited. They have the capacity to train large numbers in English and study habits. I believe that my Brazilians friends experienced a minor epiphany when the toured community colleges (our group visited Northern Virginia Community College and Montgomery College) and I did too, BTW. Before this visit They were not much interested in sending their students to community colleges, which they saw in the old paradigm as second-class or junior colleges. We were surprised by their connections with local firms and flexibility in responding to their training & research needs. Something along the lines of the American community college paradigm will be a key ingredient in Brazil’s development, especially in the integration of the new middle class into prosperity. Brazil has excellent universities to train the best-and-brightest. What they need is that bridge. I was less enamored by the receptions we got at our elite universities. Maybe they are less hungry because they already have much more demand for places in their universities than they can possibly satisfy and maybe they think they have enough international connections, but the difference was palpable. We got enthusiastic receptions at the excellent middle ranked universities and community colleges; the elite universities were polite but we tended to get one or two officials explaining that it was hard to get in. This is no real problem. As I wrote above, there are more opportunities than our Brazilian friends can exploit. I believe, and told my Brazilian friends, that rankings are overrated. As a practical proposition, you can get as great an education at a big state school as you can at the elite institution. They understand this and are sophisticated enough to look to programs and department, not to the big name. If you want to study water resources, you are a lot better off at the University of Nebraska than at Harvard, for example. So I think this trip succeeded in fulfilling all the expectations. The Science w/o Borders initiative will succeed and we helped. My pictures are from the recently completed trip. Most people will recognize the picture up top as the Chrysler building in New York with its art deco crown. The middle picture is the quad at Duke University in Durham, North Carolina. The bottom is the University of North Carolina Chapel Hill. It was our first public university. In trying to explain this difference, one of our Brazilian friends credited relative insecurity among American academics. He said that Brazilian academics are relatively well paid and secure in their positions. They are not hungry for other things. They don’t need to look for outside opportunities. Only hungry wolves hunt. American academics are hungry, at least in the figurative case. This makes a lot of sense. I am not sure the hunger metaphor is perfect, but I do think that American universities have a feeling of incompleteness. They need to partner with outsiders. This makes the universities better and more robust as well as more useful to society. This is not an uncontroversial idea. When I was in school lo those many years ago, there was a lot of gnashing of teeth that academics were getting involved with private business. There was a kind of chastity idea that universities should start apart from the hustle, bustle and especially the profit motives of the larger society. This has weakened in recent decades. Describing academics in an “ivory tower” – separate from society - is usually a pejorative description. But we still see some of this idea. There really is not much merit to the idea of separateness it, although it is resembles the valid idea that scholars should have some space for contemplation. The value of a scholarly pursuit is that it should allow the thinking person the space to think. You can be so involved in doing things that you don’t have time to think about what you are doing or why. This we should defend. But a step back or a pause to think should not mean separation. The irony for a scholar being separate is that separating yourself allows you to do exactly what scholarship should never do, i.e. isolating yourself from people and ideas that might challenge your own ideas. We all look for confirming information and people who support us. We need to be pushed out of this comfort zone usually by needing to interact with people who might prefer to avoid. That is why it is good to be hungry, at least sometimes. It forces us to get out there, try new things, innovate and overcome. Challenges lead to growth; comfort to stagnation. My pictures are Ben Franklin at the University of Pennsylvania. He was a man who questioned, tried lots of new things and produced practical wisdom. He founded the University of Pennsylvania, an academic pursuit, but he also invented the Franklin stove, very practical, discovered the nature of electricity, very technical, originated lighting rods, very helpful and described the Gulf Stream, very much natural science. And he did almost everything he did in cooperation with others. He in his person formed a good template for what universities might be. I also have a picture of a walking street at the University of Pennsylvania. I would call it a public diplomacy triumph & I don’t think it is hyperbole to say so. We held “visa days” in Rio, São Paulo & Brasilia for student going to the U.S. on Science w/o Borders scholarships. There were about 600 served today. The Brazilian government estimates that they will have sent 1500 to the U.S. by summer and more from then on thousands more. In Brasilia, we held a big event to talk to them about the U.S. and get them ready to go to the U.S. 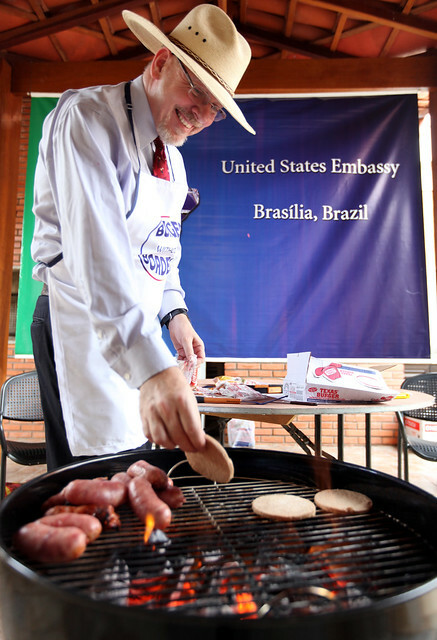 They will be spread out all over the U.S.
We called our event “Burgers w/o Borders.” The Ambassador and other American officers cooked and served hamburgers, American style, on a fried on a Webber grill. (I cooked too, as you can see in the picture.) Our goal was to create an American style cookout. Always I try to learn from our successes as well as our failures and so I have been thinking about this. Getting this first wave of Brazilians to the U.S. only a few months after the Brazilian president announced the outlines of the program is a definite success. In the midst of such success, we need to determine the role of our team. How different would be the outcome if we did things differently? We don’t want to be like the rooster taking credit for the sunrise, but we also don’t want to attribute to luck what was influenced or even shaped by our efforts. You cannot learn from experience if you take credit for everything or take credit for nothing. Results are important, but the only way to improve is to study the process that went into the results. The challenge is when we study the process already knowing how the story ended. Knowing the outcome, we work backwards, emphasizing events that seem to have contributed to what we know happened, but may not have done so, may not be duplicable or may not be recognizable in advance. Some people say that hindsight is 20/20, but this overestimates our ability to understand the real processes and underestimates our tendencies to tell good stories and create narratives even where they don't exist. Our stories usually overestimate deliberate actions of individuals involved, undervalue the importance of interactions among actors and neglect almost entirely the role of random events. We also tend to emphasize our own contributions. This is not only because we are egocentric, but also because information about our own actions is more readily available to us. With those caveats in mind, I am thinking through the process. I have written earlier about the larger program, Science w/o Borders. You can read about it here. I won’t repeat. Let me talk here specifically about our visa days/Burgers w/o Borders, the reception we gave the students that made it an event, marked a transition, and created an impression. First let me be open about what I think I can take credit for doing (caveats above applying). I take credit for taking this program seriously and conveying the urgency to colleagues around Brazil. I knew where we wanted to be. Leadership is intangible in many ways. Big successes or failures often look impossible before they happen, but then inevitable after the fact. By extension the person pushing it sometimes seems nuts before and irrelevant after. That was my role (yes - to seem nuts before & irrelevant after, and I did it well.) I didn’t let things slip, pushed for success and let everyone know that I would back them up. W/o this leadership, I am convinced we would not have achieved this result. In the bigger picture, w/o the Mission's consistent, proactive support, I do not believe the students would have gone this semester. We would have had a trickle in the fall semester and it would have seemed to be the natural outcome. “My” biggest contribution was putting the right people in the right places and letting them do what they were good at doing. I have been teaching my Brazilian colleagues the use of the word “honcho” both as a noun and a verb. I use it in a particular fashion. For me the honcho, or the person honchoing, does what is needed to make something work. He/she doesn’t always have specific power he/she is working with in other cases and has to enlist cooperation through a variety of persuasion and power methods. Another important “small” success was giving the program a catchy name. A project with a good name is almost always done better than one w/o one. We chose “Burgers w/o Borders” because it was a lighthearted parallel to “Science w/o Borders”. It also had the advantage of fitting the program and the beauty of alliteration. In other words, it is easy to say; appropriate and memorable in the sense that it evokes a concrete image. My colleagues had lots of ideas about making the event memorable in other ways. We had T-shirts and umbrellas to make the pictures memorable. Look at the picture down of the crowd with the umbrellas. Now imagine it with just a couple people with ordinary clothes and no umbrellas. Look at my picture with the Burgers w/o Borders apron and the cowboy hat. Image makes a difference, doesn’t it? On the day of the event, we put all hands on deck. There was some redundancy, but you need slack. Better to have someone standing around unneeded than have someone needed not standing by. Media was willing to cover the event because it was an event. Our press section colleagues were able to sell the it using the hook of the cookout event. They could promise good visuals and interesting stories from the student. Of course, it didn't hurt that Science w/o Borders had been in the news recently. A good PD rule of thumb is that you should not create your own wave when you can catch and ride higher on one that is already coming your way. People are interested in "their" events, not ours. We also encouraged the students to bring and use their cameras and cellular phones. Young people are natural creators on social media, but you need to create opportunities for them. Since Burgers w/o Borders was not in the Embassy proper, security let them keep their devices. Of course, much of the success was created by others. Our Consular sections all over Brazil were keys to success. They were fantastically cooperative. After all, visa day required visas. As I alluded immediately above, our security folks were also very helpful and flexible. This was a case where we were lucky, lucky to have great colleagues. I really cannot “analyze” that, except to say that keeping colleagues in the loop, showing them respect and understanding their needs is essential in any cooperative endeavor, and this category includes almost all human activities. Of course, our Brazilian friends will see it differently. From their point of view, WE are the support activity for their program and they are right. We are supporting their success. They are right too. It is a win all around, enough to go around. P.S. Students arrived on buses and had to line up to get through security. A line is a great PR opportunity, as all politicians know. You have a captive audience eager for some diversion. I worked the line on the way in, stopping to talk to forty or fifty Brazilians on as individuals. I think this made a great impression on the students. We spoke in Portuguese outside the Embassy and then English inside to show the transition. We joked about the quality of my hamburgers and generally made the personal connection. I think this is something they will take with them and remember for a long time. More pictures at the Embassy Flickr site.